I have finished a couple more baby/ bull centaurs including the standard who is a conversion with a magic mould of the original BC standard that I used on the BC renders. I still have the BC standard who will have a new weapon or maybe become the musician. The plan is to have ten of these bros ready for when 9th Age 2.0 drops. 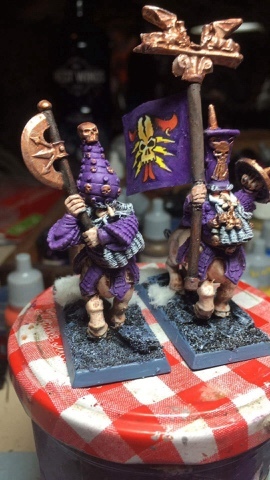 As usual the banners are colour copies from the White dwarf presents : Chaos Dwarfs with some touch ups to keep them in line with the purple theme of my army.